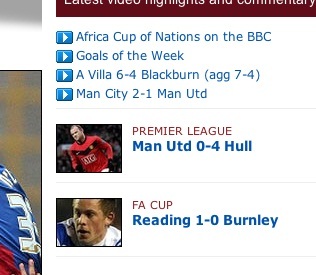 …Or Man Utd 0 Hull 4, as the BBC Sport website had it (image captured by @jfconno on Twitter). 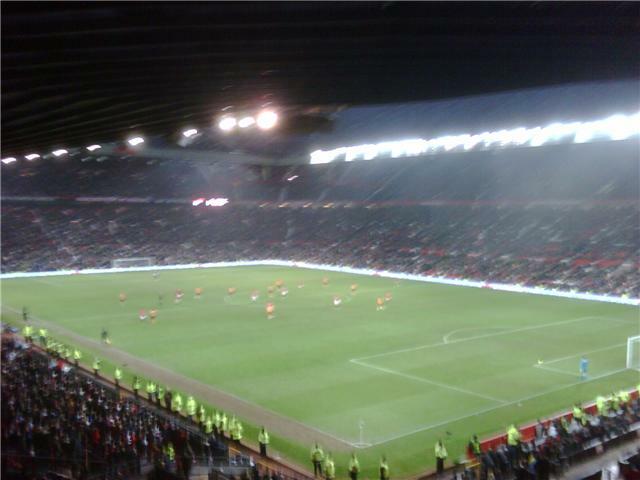 This was my first experience in the away end at Old Trafford for 23 years, a night match in the League Cup when we got shanked 5-0, going on to lose the second leg 1-0 at Boothferry Park. For last season’s 4-3 showdown, I had to settle for a seat in the home end as City’s allocation was massively oversubscribed in the giddy early days of our Premier League adventure. No such problems this year – in fact City had to push to get the last 1000 tickets sold this week. Funnily enough, fewer tourists wanted to come second time round, paying £42 minimum and with the Tigers winless on the road for nine months. Not that daytrippers were absent this year – there were as many cameras flashing and megastore carrier bags stuffed with tat in the away end as the home. Particularly displeasing were the half-United, half-City scarves – I must have spotted at least a dozen around the necks of grown men sat in the away end. Now I welcome with open arms anyone who wants to support Hull City, particularly those who invest time and money watching them in the flesh. Being a supporter shouldn’t be a closed shop and we all have to start supporting the club at some point. But surely no one can claim it’s acceptable to be rooting for both teams at a game? Despite these fence-sitters, the away end was consistently noisy throughout, which is no mean feat considering there was so little to cheer about on the pitch while the bantering opportunities with the home side were so scant. It’s easy to sneer, but United do have plenty of creative, knowledgeable, passionate supporters – witness their away support at The Circle this season and last for proof. And there were slight signs of these fans rediscovering a backbone at home too, with sporadic anti-Glazer chants the most audible noise from the home end beyond the clack of jaws on prawn sandwiches. But for every person in the ground vowing to ‘love United, hate the Glazers’ and wearing the green/gold protest colours of United’s forerunners Newton Heath, there were ten nudging their mates to ask why there were so many people in the stadium with Norwich City scarves. Tens of thousands who fly in from around the globe, watch the game in silence as if it were a theatre production and who probably think the Glazers are people who fit windows. I despaired for the real fans peppered among these imposters. As for the game, we were probably closer to snatching a point than last season, despite the big scoreline. Following Wayne Rooney’s early pounce on some Boaz Myhill spillage City rode their luck for 80 minutes, staying well in the game at just one goal down as Michael Owen in particular squandered chance after chance. Then the turning point – sub Kamel Ghilas should have equalised, having created some room in the box and dragging a shot across the goal, but it dribbled narrowly wide. Cue three late Rooney goals to punish us. However, it’d be foolish to try to create a scapegoat for our defeat. Despite Antony Gardner and Kamil Zayatte’s central defence partnership continuing to flourish, and sub Bernard Mendy impressing as he so often does against the big sides. we did not particularly deserve a draw. To even entertain the notion that a team playing Fagan as a lone striker could land a blow on the champions is laughable. It was baffling to see Jan Vennegoor of Hesselink overlooked in favour of Kevin Kilbane when making our last sub with the score at 1-0. Also, after Rooney ripped us apart at home, why did we not put a man-marker on him throughout the rematch? Dimitar Berbatov, Nani, Paul Scholes and Owen could be playing now and still not score. If we’d put someone on breathing down Shrek’s neck rather than giving him the freedom of Stretford, we may have had a chance of stopping their danger. Teams have man-marked Jay-Jay Okocha and Geovanni in our recent past, sometimes even double-marking them, and neither of those players were anywhere near as dangerous. Case closed? Hopefully not. Though both I and the referee missed it, Rio Ferdinand reportedly punched Craig Fagan. This warranted not a mention in online match reports nor the Sunday newspapers I read, while the lack of Match of the Day that night meant it was not exposed to a TV audience either. But it’s hard to see how Fagan would have escaped unpunished if the roles had been reversed. Equally, when the referee whistled for Nani’s blatant dive for a penalty, where was the accompanying yellow card? And when we had a defender prostrate in our penalty box with a head injury as United scored their crucial second goal, surely the referee should have stopped the game by then? But our defeat was not due to the ref, now will our relegation be caused by defeat at Old Trafford. Bigger games await, starting with Wolves on Saturday. Hull City have today been pipped by relegation rivals Bolton Wanderers to the loan signing of Manchester City’s Vladimir Weiss, who is regarded as such a hot prospect by the Blues that Trotters boss Owen Coyle probably had to wear oven gloves to sign the deal. This transfer isn’t particularly shocking as, due to our straitened finances, City were apparently haggling over what proportion of the Slovak winger’s wages we could afford to pay. Presumably Bolton jumped in offering to pay full whack and therefore now have someone till the end of the season who may play a big part in their, er, relegation. Anyway, don’t despair. Perhaps we have an exciting – and cheaper – young wingman right under our noses. According to the Manchester Evening News today, Tiger cub Will Atkinson was so impressive on loan at Rochdale that Phil Brown recalled him this week. despite Dale’s attempts to extend the deal. In recalling Atko while he’s playing well and presumably having at least some of his wages paid by someone else, Brown must think he may need him soon. So expect to see him on the bench soon alongside Tom Cairney and hopefully, one-match wonder Liam Cooper. As a sharpshooting right-winger, Atkinson must be worth a punt if Brown can look beyond how far Craig Fagan and Richard Garcia run on Pro Zone stats and see how many goals they actually contribute.